The national food rags have discovered Texas barbeque! Bon Apétit and others have recently sung the praises of Franklin’s in Austin, Mueller’s in Taylor, and any number of more obscure barbeque joints. In Austin, the 107º heat persuaded me that I didn’t want to line up outside Franklin’s and wait two hours or more to order (hoping desperately that they wouldn’t give the guy ahead of me the last nub of brisket). So no Austin barbeque for me! But I did get lucky in Seguin, the town about 40 miles east of San Antonio where my sister Jacque lives. 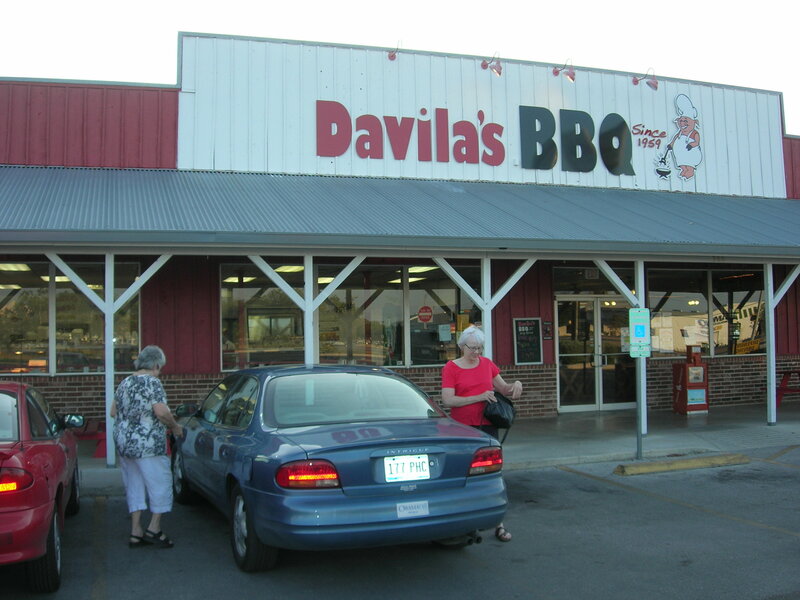 By bbq-joint standards, Davila’s is upscale–instead of butcher paper, you get an actual paper plate on a tray, and you get to sit in air-conditioned ease in a pleasant dining room. 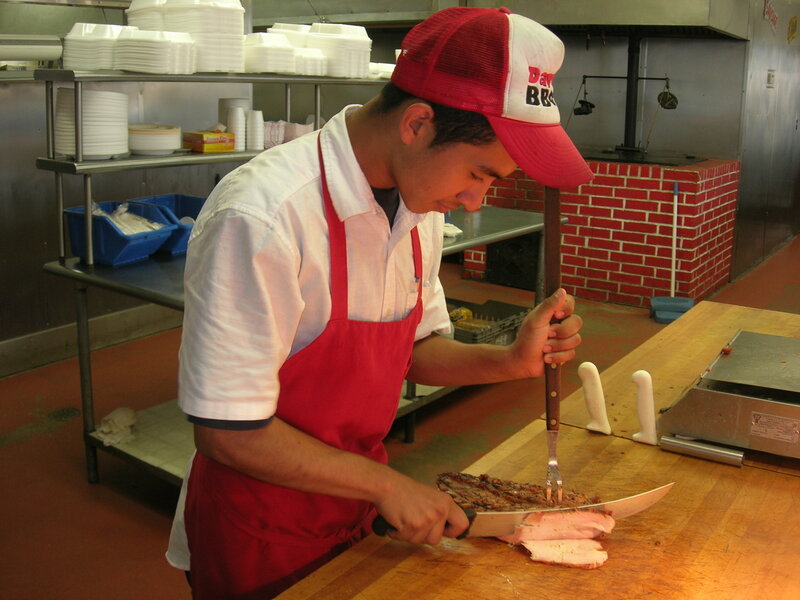 But the meat is the real thing, smoked to a char on the outside and melting with flavor and juice on the inside. My sister and I might as well be the Sprat family; Jac can eat no fat and I can eat (almost) no lean. 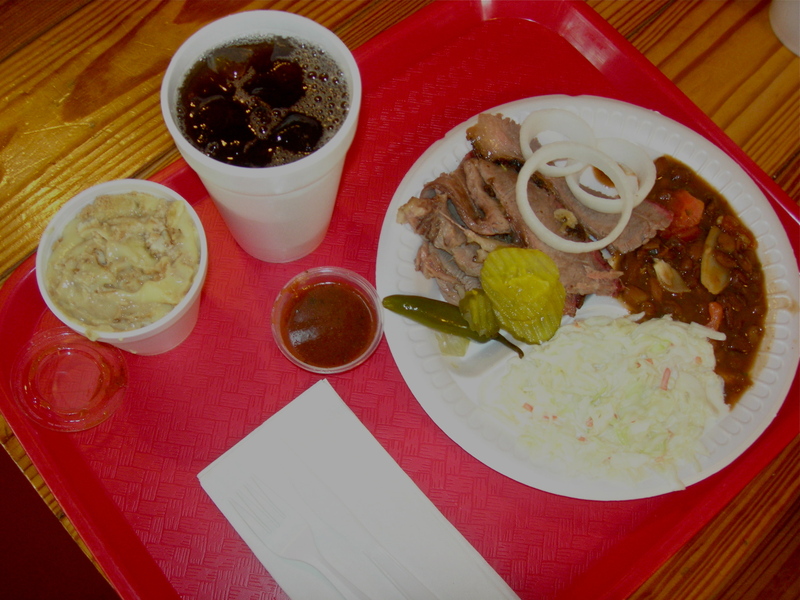 But we were both happy here; she had the sliced turkey and I went with the nicely marbled slices of brisket. (And our friend Alicia looked pretty pleased with her ham.) I added sides of slaw and borracho beans (“drunk” beans, made with Mexican beer), with the usual garnishes of barbeque sauce, onion and pickle slices, and a jalapeño. I decided against the slice of white sandwich bread (heresy–the slice is iconic bbq fixin’s), but I did go for the styrofoam cup of banana pudding. And of course, a big cup of sweet tea. Seguin is a friendly town; Coraima Acuña, Alicia’s across-the-street neighbor, was working that night, so of course they had to say hello. The other two folks behind the counter were Ariel Perez (on the left) and Josue Fuentes. 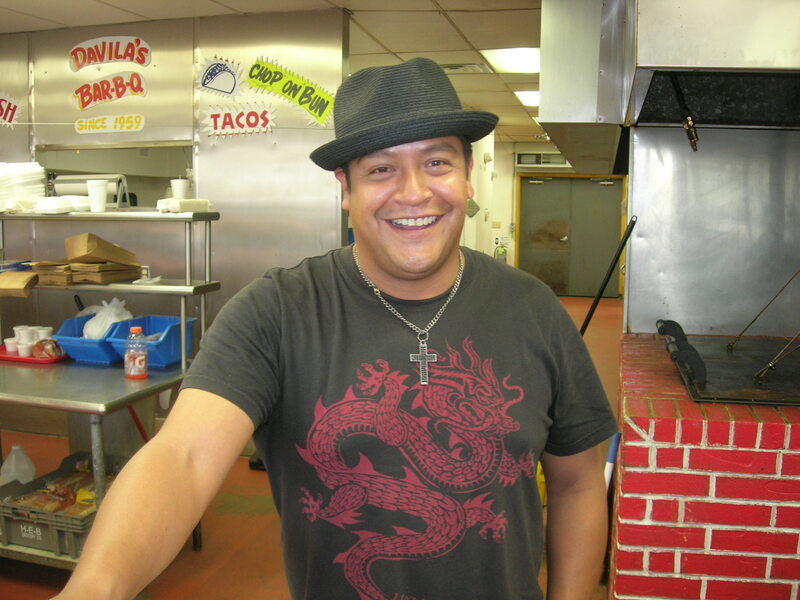 Davila’s speaks barbeque with a Spanish accent; you can also get fajitas, tacos, and other dishes that draw on the long traditions of Mexican barbacoa. 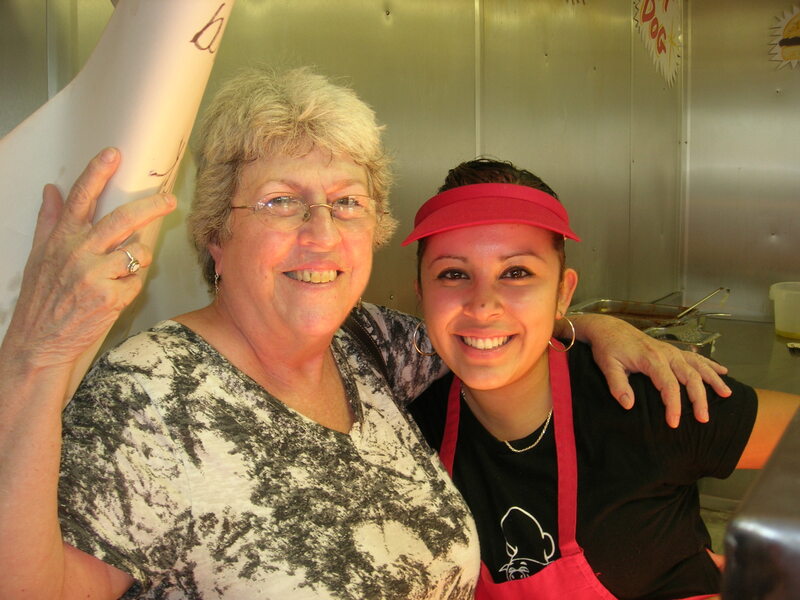 And if you need a burger or a po-boy or a piece of fried chicken, they can help you out with that as well. American food, jostling through an ethnic and regional crowd of flavors and preparations! 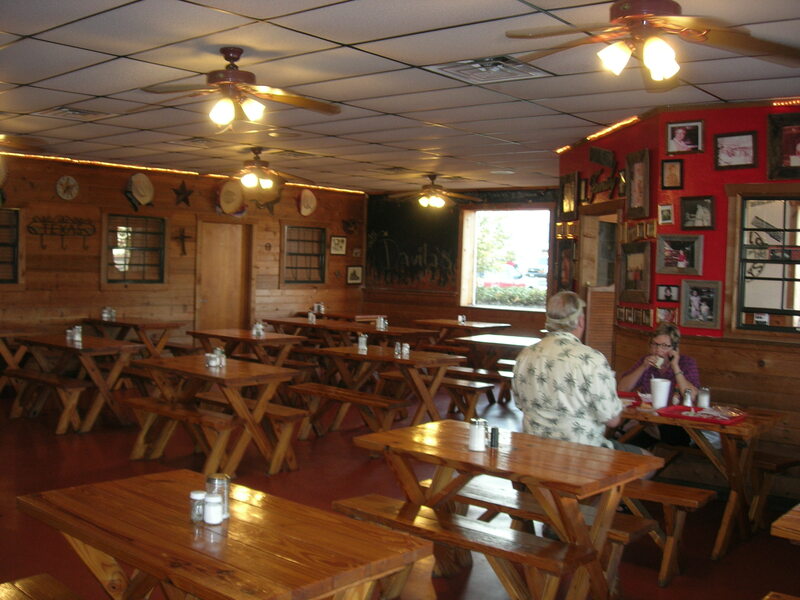 Not your typical single-minded bbq joint, but a local fixture of a restaurant offering great barbeque that can hold its own in the crowded Texas Barbeque Belt.